Solar cooking or Crockpot cooking? We all know the importance of having convenient cooking methods, otherwise cooking can turn out to be difficult. Sometimes, we do not think much about energy efficient cooking until the electricity bill skyrockets. However, using energy efficient cooking methods can mean a considerable difference in both electric bills, and excess heat, if you are hosting frequent get-togethers at your home. Having a reliable and cost effective cooking method is an option. In fact, you can cook food using free energy from the sun. From a cost saving point of view, the term “free energy” entices most of us. However, free energy does not necessarily mean that the cooking method will be free of cost. Cooking with the sun can require some investment in getting the necessary equipment to harness the free energy. On the plus side, however, solar energy is a type of energy that is available to anyone, regardless of boundaries. Any human on the planet is equal when it comes to the sun. It just requires some level of time, energy, education, and often a little money (or ingenuity) to harness the power of the sun. Most people agree that solar energy is the best commonly available alternative source of free energy. After all, the sun powers the actions of solar, wind, and geothermal energy on our planet. However, solar cooking is often viewed as “fringe” or something “those greenies” or “treehuggers” do. 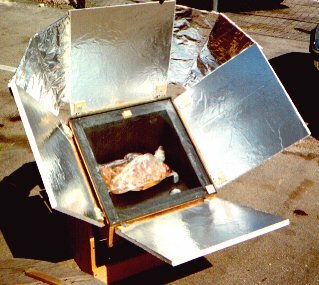 In any case, solar cooking is nowhere near as common as crock-pot cooking or other conventional cooking methods. And so, that brings us to the point of this article. If you were given a choice between “free” solar cooking and crock-pot cooking, which option would you choose? The crock pot might seem easier to use because it may be what you are familiar with. However, here are a few points that can help you make a decision. From the efficiency point of view, both solar cooking and crock-pot cooking are energy efficient, but Solar cookers use solar energy; the amount of energy that your solar cooker traps depends on its design. In the case of crock-pots, also known as slow cookers, the electrical energy consumed is far less than other electrical based equipment (such as a household oven or range. Most crock-pots consist of a ceramic pot enclosed by metal, which allows heat to be retained longer. As a result, the energy consumed to heat the food is held within the vessel being used to cook the food, and energy use is maximized. However, with the sun, there is no electric energy consumed to heat your food, just the light from the sun reflecting into a pot or cooking vessel. With regard to energy efficiency, solar cookers win. Another point to consider is cost. Solar cookers are relatively inexpensive. Even commercial solar cookers can be affordable and can purchased online through stores like Amazon.com. You can even build your own solar cooker. There are lots of plans available both for free and for some minimal cost (some including videos on YouTube) which can show you how to build a solar cooker that will trap significant solar energy for a variety of purposes. 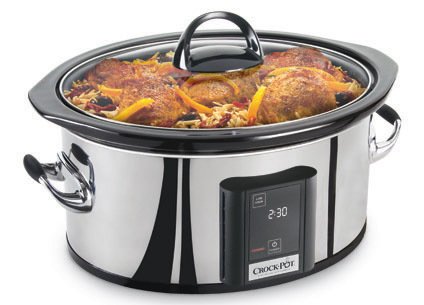 Crock-pots, by comparison, won’t take much time, as they are pretty much plug and play right from the box. A good crock pot can be purchased for $50, or a cheap one for $25-$30. Look around and you can probably find one at Goodwill or a local garage sale. However, most people’s crock pots will last them 30 years or more. The other factor to consider with regard to cost is the electricity cost, but crock pots cost very little to operate, particularly ones that are more energy efficient. Generally speaking, crock-pots are easier to use than solar cookers. Simply plug in and you’re good to go. With a solar cooker, you have to make sure you have a sunny day. Outside temperature is not as important (for a well-built solar cooker) as a good sunny day. Depending on what kind of solar cooker you have, you also have to be careful about cooking meat, whereas when cooking in crock-pots, you don’t have that concern. As far as the cooking time is concerned, crock-pots can take shorter or longer. It really depends on the amount of sun you get per day. We have seen videos on YouTube where a solar cooker gets up above 425+F (190+C) If you do things correctly, the heating of the food in both a solar cooker and a crockpot should be even. The design of the solar cooker plays a major role in determining the amount of energy that the cooker can trap. Some have suggested that the maximum heat a solar cooker can produce is 900 Fahrenheit, which would obviously be too hot for cooking food, but is a good demonstration that solar cookers can get quite hot using nothing but the sun’s energy. An important thing we need to keep in mind is that solar cookers are not tabletop cookers. Unless you’ve got a solar cooker set up that is ready to go and you have reasonable assurances that you will have a cloud free day, you may prefer a crock pot for daily usage, especially if you want to know exactly when your food will be done. However, solar cookers provide many advantages that you cannot find in any conventional methods. Solar energy is a natural energy, it’s free, and helps to retain the nutrients in foods during cooking. Moreover, with both crock pots and solar cookers, the food is not exposed to smoke (grills) or radiation (microwave). If you have a regular 9-5 job and a “normal” type life, a crockpot is probably the best option for you, at least during the week. For you, a solar cooker might be better to use on the weekend. Overall a solar cooker is the less expensive option in the long run, and is also but it’s also less predictable (depending on where you live) and might best be used by the average person on a weekend. About the author: Amanda Kidd is the name of the person who originally submitted this article. Basically, Amanda Kidd appears to be a fake alias that is used to make a non native-speaking link-building company look legitimate. The article was not readable or useful in the format it was submitted. GreenJoyment took some serious time (2+ hours) to edit and clean up this article to make it useful for our visitors, including correcting major inaccuracies about the disadvantages of both solar cooking and crock pot cooking . Amanda (or whoever it is who is submitting junk content just to get listed back from our site) asked us to link to articles about Green Lifestyle and wi fi adapter. It appears that “Amanda” is pretty much just submitting re-hashed and plagiarized or machine-written content with the hopes of getting a link. We’re done editing other people’s junk content, so if you are going to submit it, don’t. However, if you think you can actually write good, in-depth, well-researched content, we’d love to pay you $8-$12 per article. You have to be knowledgeable about something related to going green. If this sounds interesting to you, please contact us with your writing experience and interest. Well, this is just one more reason to come to Tasmania. 9 days sufficient backup is quite incredible! Could we come and visit some time? our area of Aussie land, you would be welcome to visit and meet an old 2 legged Tassie Devil by name of Dave or Pomso. they give me a spell from the hardest job I have to do down here Johnathan, trying to look intelligent all the time, hi hi..
Hey David! I would love to have some pictures and explanations of what you’ve done… if you can make the time to put them together, that would be fantastic. I will email you the best email for sending it to privately. I doubt you’re “trying to look intelligent”, but I catch your drift. It’s interesting when you start tinkering around with lots of things because you realize how infinitely *little* you know, while realizing simultaneously how much more you know than the people around you. Please do continue to read and comment in your quieter moments. We can definitely benefit through your insight, and I’m glad to know that we provide something in return. Looking forward to our trip to Aussieland!